Carnival Vista arrived at its new homeport of Galveston this past weekend. She’s the largest ship ever to homeport there. In attendance at the homecoming ceremony were Carnival Cruise Line president Christine Duffy and ship Godmother Deshauna Barber, the first member of the U.S. military to be named Miss USA. Carnival Vista has operated out of Miami for the past two years. Part of the line’s newest and largest class of vessels, her features include the SkyRide aerial bike ride, an IMAX theater, onboard brewery, two dining venues developed by Food Network star Guy Fieri, an expansive water park, and the Family Harbor accommodations with larger staterooms and a lounge area. 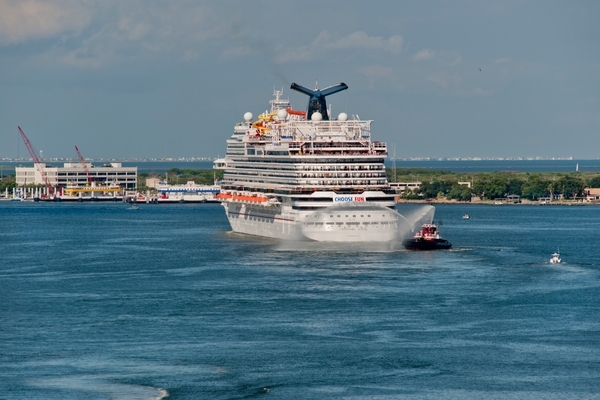 Carnival Vista will offer two different week-long western Caribbean itineraries from Galveston. One itinerary visits Montego Bay; Grand Cayman; and Cozumel, while the other features calls on Mahogany Bay (Isla Roatan); Belize; and Cozumel. In addition to Carnival Vista, Carnival Freedom and Carnival Valor are also deployed year-round from Galveston. In total, the three vessels operate more than 200 sailings each year and carry more than 600,000 passengers annually. During the homecoming event, Galveston Mayor Pro Tem Craig Brown presented Duffy with a key to the city and proclaimed Sept. 23 “Choose Fun Day” in recognition of Carnival’s brand campaign. The line also made a $10,000 donation to Houston SPCA and an additional $10,000 to the Houston Food Bank. Earlier this month, the Carnival AirShip made a flyover above the Houston and Galveston areas.